Today is Saturday, time to celebrate with Ruth Ayres and my fellow bloggers, but first I must stop and post a line to the Progressive Poem, the brainchild of author Irene Latham. This year’s poem has taken on a pattern. It rhymes, too, but I am grateful I don’t have to complete a rhyming line. All I have to do is set up the next stanza. The pattern of first lines began with Laura’s “A squall of hawk wings stirs the sky.” Then Penny made the decision to repeat this pattern in “A cast of crabs engraves the sand.” So all I have to do is fill in the blanks “A __da__ of __de___ __da-da____ ___di___ __doe___.” Where do we want to go next? From observing the sky to the ocean we have watched hawks and hummingbirds and crabs. I have been working with images for my poem a day project. 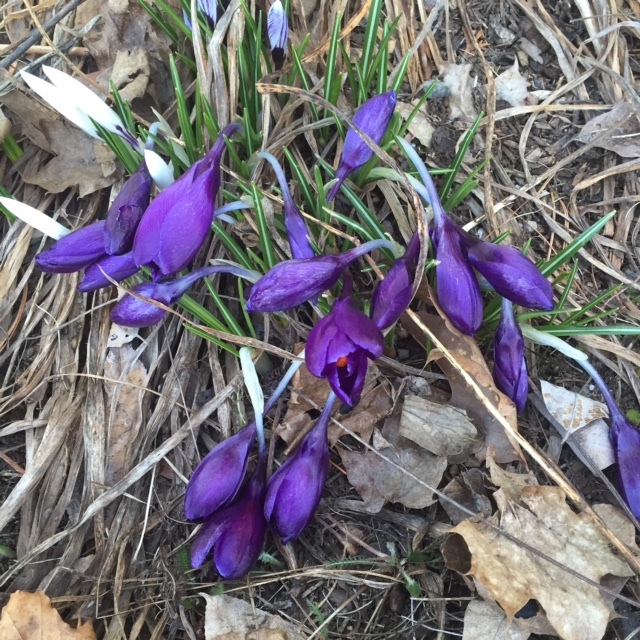 My friend, Kimberley, in Maine sent me this picture of purple crocuses in her yard wilting in the recent cold snap. I decided to keep us in the natural world but move into the plant world. In the spirit of poetry and connecting through blogging, Kevin Hodgson left a comment on my abecedarian post yesterday that honored me as a writer, but also honored the entire blogging community. Thanks, Kevin! What a wonderful tribute through the alphabet, with many of your own words gathered from what I seem to remember. Your poem line is going to keep this poem full! Great realm to take us into next. Happy Poetry Month, Margaret – and, crocuses! There’s a lovely surprise. I’m enjoying these flights of fancy taken in our poem, but since the PP dived deep not long ago, I think returning to land is welcome. Thanks for sharing Kevin’s fun abecedarian poem, too. on April 9, 2016 at 3:02 pm | Reply Janet F.
The poem by Kevin is wonderful. Thank you for sharing it. I need to catch up on the abcderian post (among so many others)…I marvel at the time management of my hard-working blogger/teacher/poet friends who manage to get around to so many places. They are lucky because it is filled with light, love and poetry this month for sure. I love how the crocuses from Kimberley nudged your line to life. The sun and plants and spring, ah spring. Wondering where the PP will go next. And believe me there are a lot of us up here in the north craving the sun and its re-newing warmth. I first used cluster, but the rhythm was off. I hope clump isn’t too,,, clumpy, but craving the sun is yearning enough. And we’re heading to the plant world…I love it, Margaret. Crocuses is perfect! We’re still celebrating the wonder of nature as this poem roams from place to place! And I love Ken’s abecedarian poem. Thanks for sharing it. These lines sing in my heart today. Love seeing the connection this post has. From Kimberley’s crocuses to Kevin’s brilliant poem. I love that you added another realm of nature to this, Margaret. And Kevin’s poem is just amazing! A clump of crocuses is a wonderful addition, Margaret! Thank you, also, for posting Kevin’s poem. Keep up the Zydeco, my friend! Margaret, I think the use of the word clump is refreshing even though they are wilted and desperately need the sun as you so aptly said. Nice alliteration in your line that follows the pattern used by others. What’s next? There is such a spirit of collaboration in your post today: PP poets, Kimberly’s photo sparking your thoughts, Kevin’s poem as a tribute. I’m back from a long weekend away, Margaret and trying to catch up with some posts. 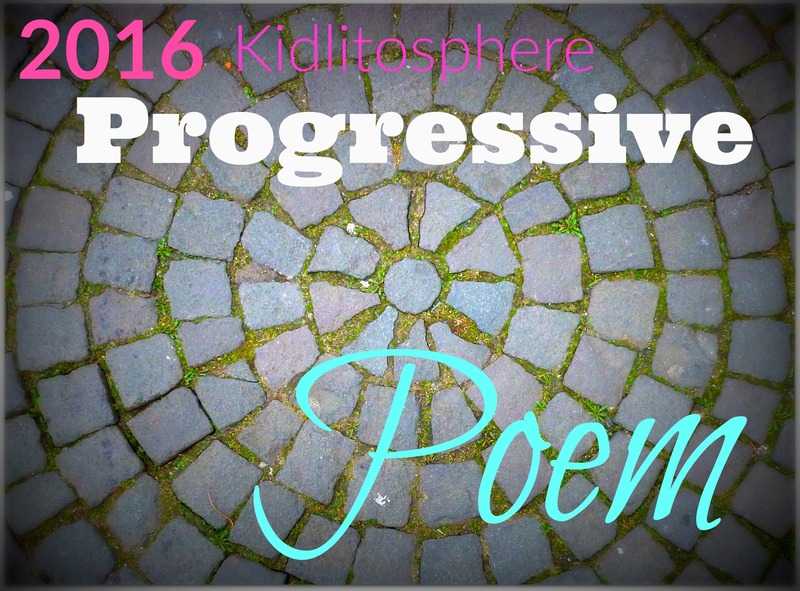 I’m glad I didn’t miss your lovely addition to the Progressive poem and the rest of the post with Kevin’s poem too. Beautiful! “Clump” IS the word for crocuses. Ours were buried by snow…but are now free again. I love seeing their little faces each year. Kevin’s poem to your blog is such fabulous honor! Hi, Margaret–I’m so very behind in following the Prog Poem, but catching up today line by line. Return to earth, yes! clump and crocus and crave, yes! I’m thinking this is the start of our third stanza…but I’ll find out!